Everyone knows it's a little more fun to work out with company. We hope that you and a buddy can get to know each other a little better with these partner exercises we put together for About Health. You can view the full article by clicking HERE, but we've taken the liberty of summarizing them below. Each partner lies on their back, facing each other with their arms out, extended over their heads. One partner holds a medicine ball behind his/her head. Both partners perform a situp at the same time, and at the top of the situp, the person with the weight passes it to his or her partner. One partner stands up while the other partner lies on his/her back, head by the other's feet, hands gripping their ankles. The partner on the ground lifts the legs toward the partner’s chest, keeping the knees slightly bent as the legs raise up. Once the feet reach about chest level of the standing partner, he/she throws the legs back toward the ground. The person on the ground must resist the force, keeping his or her feet from touching the ground. Raise and repeat while also mixing it up and working his/her partner’s obliques by throwing the legs left and right. Each partner lines up in a pushup position with their heads facing each other. Descend into a pushup until your chest reaches the ground, then on the ascent, each partner lifts their right hand off the floor to slap a high-five with the other. Alternate hands on each pushup. Start by standing back-to-back (backs touching) with your partner. Slowly start to descend into a squat while simultaneously slowly walking your feet away from your partner. Descend until your hips are even with your knees and your legs are roughly forming a 90 degree angle, thighs parallel to the floor. Hold as long as possible. One partner holds a low plank on their forearms, while other performs a burpee next to the planking partner (bodies are parallel to each other). Instead of jumping straight up as in a normal burpee, hop laterally over the planker’s calves/ankles. When Women's Health asked us to help their readers spice up their sweat sessions, we said there's no better way than make them into games you can play with a friend. Here are 3 fun workouts that'll unleash your competitive side. 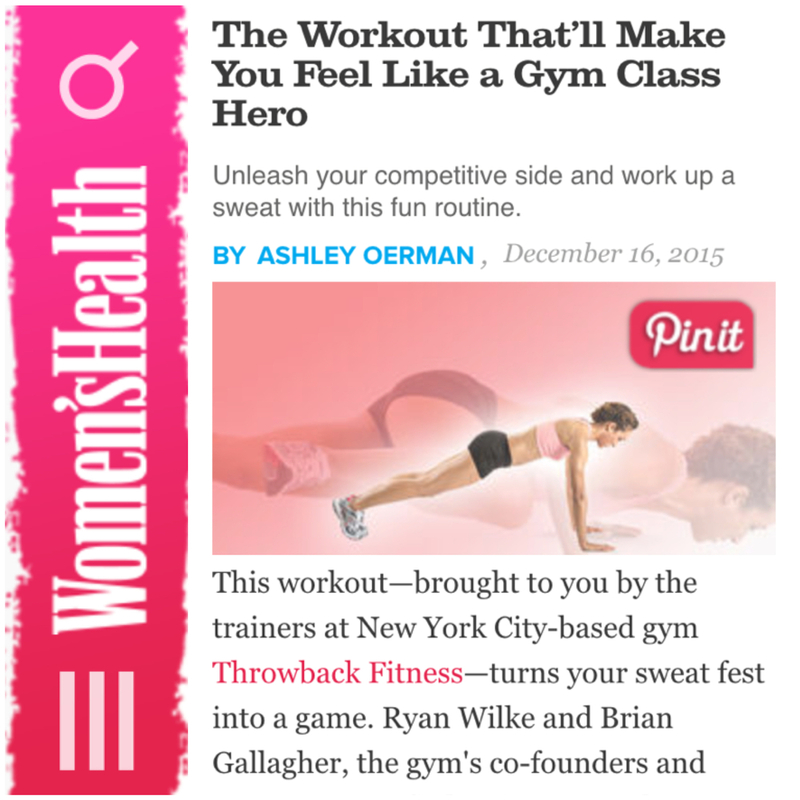 You can view the full Women's Health article by clicking the image to the right. We've also laid out the 3 workouts below which can all be completed at home with minimal equipment! When switching with your partner, pick up on the circuit right where they left off. Try to complete as many rounds of the circuit together in 15 minutes. If you're short on dumbbells for the shoulder press, use a bodyweight exercise like squat thrusts. Scoring example: If you finished the round of 8 in part A and finished the round of 3 in part B, your score would be 5.